The Keyword Suggestion feature can help you identify the most valuable keywords and phrases to use within your string of keywords. With this module, you are able to view keywords based off of the keywords your selected app is currently ranking for on the selected app store. Your Seed Keywords are keywords pulled from Keyword Rankings that your selected app is currently ranking for on the selected app store. This feature allows you to find potential keywords for your keyword string that you can begin tracking in Keyword Rankings or add to your keyword string within Keyword Optimization. 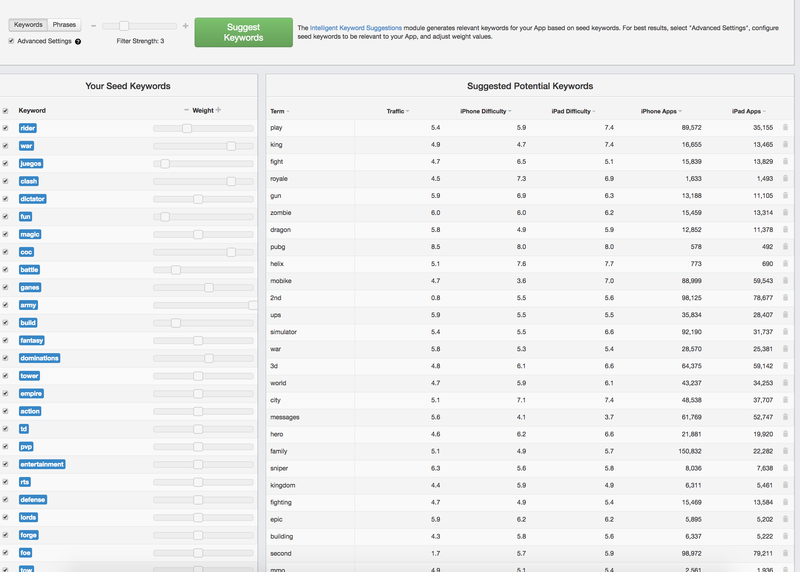 The Filter Strength within Advanced Settings lets you weigh your current keywords differently based on importance and relevance and lets you control how closely the suggested potential keywords resemble your current keywords.